A friend asked me today which of our previous homes I like best. I feel really lucky — we've lived in so many wonderful homes and I've genuinely loved them all. Here's a timeline, in photos (of varying quality), of all the places we've lived since we got married. Brace yourself. This is long! Those chairs were hand-me-downs from Paul's grandparents. I snagged the Tanzanian tinga-tinga painting from the previous occupant of a room I lived in during a summer in Tanzania. That Moroccan rug has graced every one of our homes. Paul picked it up as a student and hand-carried it through the airport. We moved to Tanzania two months after we got married. Paul worked for Houghton's study abroad program and I worked as a tutor for a staff family (and moonlit as a resident advisor for the college students). We first lived in a tiny thatched cottage. Moving into this house felt like such an adventure! I can still vividly remember how the place smelled like wood varnish and our vanilla Yankee candles. 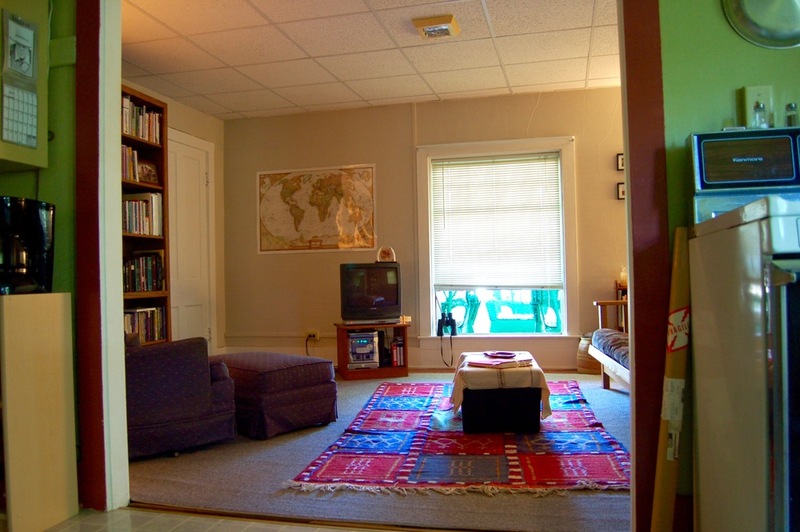 I have great memories of hosting groups of students in the tiny living room. This may be the coolest house we've lived in. The house was built around two boulders. It was the study abroad program director's house, just up the hill from our tiny cottage. The director "gave" us use of the house as a wedding present. While we were there, Paul built a deck around the back, overlooking a waterfall. We lived in another thatched cottage our last few months in Tanzania. I (sadly) can't find any interior photos. The house differed from our first cottage in that it was larger, had a loft above the bedroom, and had wood (instead of concrete) floors. It was beautiful, but most of my memories of the house have to do with horrible morning sickness and a (really nasty) rat infestation. We returned to the US summer of 2008. I was pregnant with Anna and Paul was applying for jobs at NGOs and universities in DC and at Penn State. Paul was offered a job at Penn State a couple of weeks before school started. It was the worst time of year to find an apartment at Penn State. (Most places are rented out in the spring for fall occupancy). We were looking for ANYTHING and I lucked out when I found a Craigslist listing for a two-bedroom mother-in-law unit within walking distance to the university. The rent was steep, but it was otherwise perfect. We furnished the house with pieces from Paul's grandma, who had just moved into a retirement community. The bookshelves were Paul's from college. The loveseat? We found that on the side of the road, by a dumpster. Our only brand-new purchase was the chair and ottoman (faux leather from a discount retailer — it only survived a few years). Despite how happy we were in the Overlook Heights place, I couldn't help but continue to cruise Craigslist apartment/real estate listings. But it paid off when I found an apartment even closer to campus and $225/month cheaper. Best things about the apartment? It backed up to my favorite park in State College. We had a vegetable garden. I could ride my bike to school in about 5 minutes (with no hills to climb — practically impossible in that town). We had brand new wall-to-wall carpeting. I know that last one sounds gross, but it was PERFECT for a crawling and newly walking baby. And I have so many memories of lying sprawled in random parts of the house, reading. There were big windows overlooking trees. It was so cozy during the winter. I get a little choked up thinking about our E. Irvin house. Moving there was a dream — we never thought we would be able to afford a house in downtown State College, but a first-time homebuyers' program made it possible. The house was a mile away from the library. Half a mile from our favorite coffee shop. It was on the bus route. Paul could walk or bike to work. The house was right on the corner, by a busy street — we often heard friendly honks from friends passing by. It was the perfect location to start a Little Free Library. It was a modest house, but such a great one for entertaining. We had a monstrous backyard with a deck, a hill, a rope swing, and an apple tree. I loved the fire place in the living room, loved the giant picture windows, our chalkboard door. We even grew to love the midcentury, split-level style. When we moved into this house, I vowed never to move again unless we were moving out of the country. I kept my promise. As much as I loved our E. Irvin house, I didn't love most aspects of being a homeowner. So mixed with the sadness of saying goodbye to that home was relief that we would once again be renters (actually, not even renters — my employer provides our apartment for free!). The first time we stepped into this home, it was after midnight so we were a little punchy. But I vividly remember being awed by the giant space. The kitchen? Massive. The rooms? Way bigger than our old house. The next morning, we were speechless when we saw the views from both balconies: pineapple fields, hills, mountains, downtown Kaohsiung. We requested that the living areas be painted white, and it was a great decision. The apartment is always flooded with light. We got rid of a lot of our furniture before moving so it felt like we were starting from scratch in terms of decorating. We have lately been drawn to more minimal interiors, quite opposite from the somewhat rustic coziness of our previous places. We decided to try to be sparing when filling the house and I love the result (although I miss my walls of books). When Anna heard I was putting together this post, she told me our current apartment is her favorite. It's mine, too. Because (with the exception of the rat cottage) each home has been my favorite while we were living in it, which is pretty awesome.